Breakfast lovers are simply people who love breakfast. 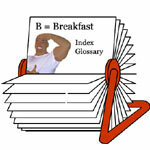 It's also used as a term of affection to describe recurring visitors to MrBreakfast.com. How do I get my bacon to be crispy?